Education was always one of Krishnamurti's chief concerns. He felt that if only the young and the old could be awakened to their conditioning of nationality, religion, prejudices, fears, and desires, which inevitably leads to conflict, they might bring to their lives a totally different quality. His concern found expression in the establishment of schools in India and abroad. 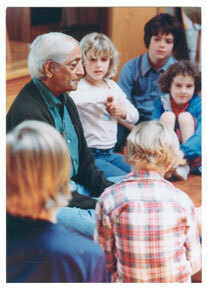 When Krishnamurti spoke to school children, his language was lucid and simple. He explored with them their relationship to nature and to one another, and to psychological problems like fear, authority, competition, love and freedom. To him the schools were a milieu in which the larger existential issues could be explored in an atmosphere of freedom and responsibility. The more apparent features of this spirit are shared by all schools—large campuses of great natural beauty; a friendly, caring relationship between teachers and students; simple, wholesome vegetarian diet; austere but comfortable living quarters; spacious and inviting classrooms; well-equipped libraries and laboratories; and a small teacher-student ratio with highly qualified and motivated teachers.